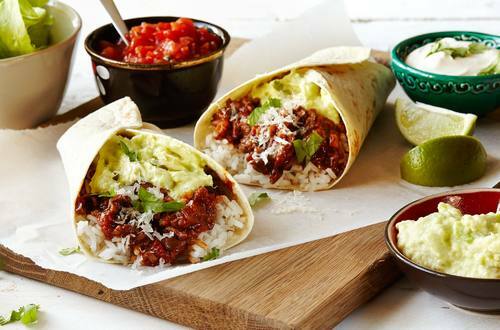 Warm flour tortillas stuffed with a hearty ground beef mixture and rice, layered with an avocado spread made with creamy Hellmann's® or Best Foods® Real Mayonnaise. 1 Combine avocados, Hellmann's® or Best Foods® Real Mayonnaise and lime juice in small bowl. Cover and set aside. 2 Heat oil in large skillet and brown ground beef over medium-high heat, stirring occasionally, about 6 minutes. Stir in shallots, garlic and chili powder and cook over medium heat, stirring occasionally, 2 minutes. 3 Pour boiling water over Knorr® Chicken flavor Bouillon Cube; stir until dissolved. Pour chicken broth and tomatoes into ground beef mixture. Bring to a boil over high heat. Reduce heat to low and simmer, stirring occasionally, until thickened, about 15 minutes. 4 Spread tortillas with some of the avocado mixture; top with hot rice, ground beef mixture, then cheese. Roll up and serve with remaining avocado mixture and, if desired, salsa.